We are thrilled to announce that the next exhibition at Lawrence Alkin Gallery will be ‘M*A*S*H*E*D’, a collection of new works by Scottish artist War Boutique. War Boutique’s art sees the incorporation of military armour, weaponry and other resistant materials to create work that conveys a strong anti-war message. He plays around with the parallels between the clothing associated with war and trends found in mainstream fashion. 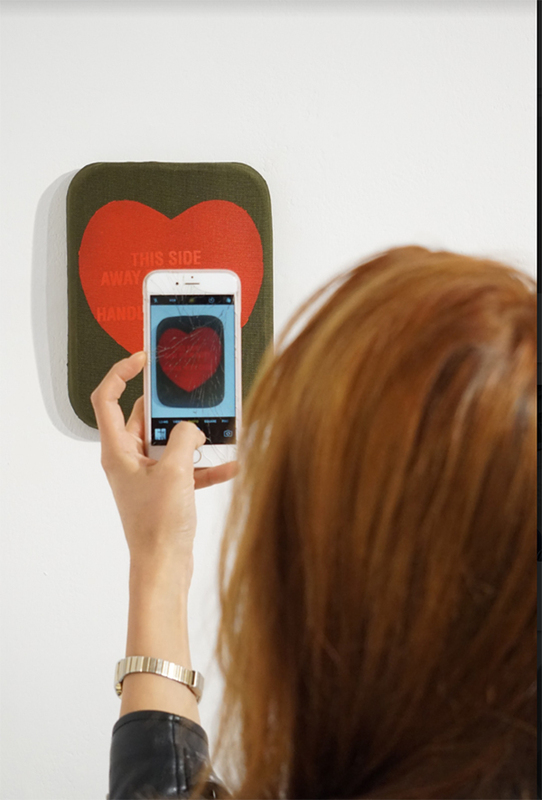 M*A*S*H*E*D will feature more than 20 mixed-media works by War Boutique imbued with astute commentary on a variety of issues from police brutality, recent wars and the monarchy. In our central London gallery, the exhibition will be split over two floors, with the top floor focusing on ‘military’ themed works and a ‘civil defence’ theme downstairs, with more playful works in War Boutique’s signature style. “With these new works I wanted to physically manifest some of the real force and impact of modern-day weaponry, and perhaps invoke our collective responsibility and choices around the use and development of such forces”. War Boutique was born in Glasgow in 1965 where he began working in theatrical costume and fashion design. He went on to attend The Scottish College of Textiles in Edinburgh where he developed skills in knitting, weaving, sewing, embroidery, textile technology and the design of prints and pattern-making. Alongside his art practice, his early career involved designing defensive equipment and body armour for national armies and police units including London’s Met force. As well as regularly visiting top secret MOD based and compounds around the world. 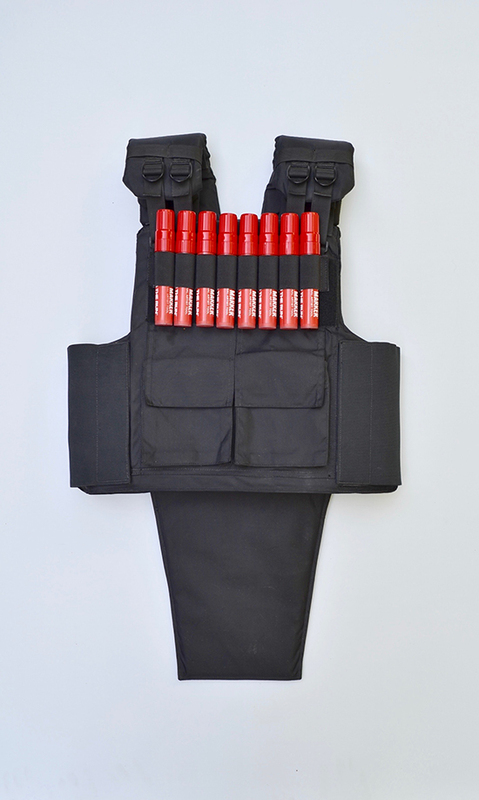 Following the invasion of Iraq in 2003, he gave this up, and began incorporating the flak jackets, stab vests and ballistic military materials from this earlier experience into his art practice. War Boutique's work has been exhibited at various prestigious museums and galleries, including the Courtauld Institute, British Museum, Tate Modern, National Army Museum and Somerset House. The show will also debut the artist’s new ‘Camouflage’ series of large-scale oil paintings on military textiles. These absorbing camouflage canvases contain provocative references to the abstract expressionist movement of the mid twentieth century, in particular, the all-over aesthetic of Jackson Pollock, playing around with notions of ego, masculinity and conflict. While the new ‘Blast’ paintings are created by firing paint-filled plastic bullets at large scale metal shields, similar to rounds police use during riots and civil disturbances. M*A*S*H*E*D is an exhibition that’s timing seems suitably apt; during an era of global conflict, unrest and tension War Boutique presents a body of work that sees the materials of war repurposed into fine art, transmuting their power to act as warning beacons for society against growing militarization. This exhibition is encouraging us as a society to move away from violence, towards peace and prosperity in a fascinating and unique way. 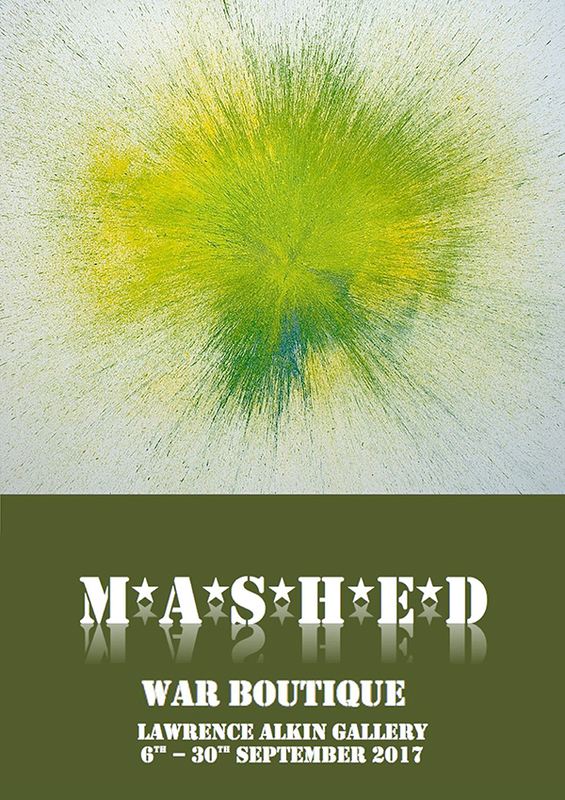 M*A*S*H*E*D by War Boutique will begin the autumn program in our gallery; resuming solo shows after our summer group show MIX. To register your interest in the show or to receive the PDF sales catalogue please contact the gallery on +44 (0) 20 7240 7909 or email us at info@lawrencealkingallery.com.